Well, I couldn’t resist giving it a go! 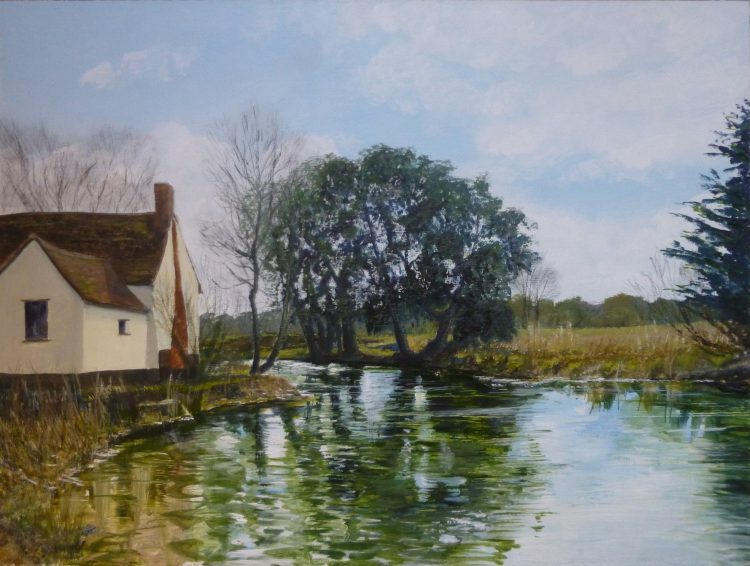 When I was walking around at Flatford a few weeks ago I thought, yes, you can quite see why John Constable painted this view so many times, of the cottage and the river. The view is not really the same now, though. None of the trees that grew in his day are there any more. The level of the river is about two feet higher. And a flood bank has been built on the other side of the river. But the National Trust do their best to keep it as similar as possible given these constraints. Next up in my ‘Four Seasons on the Stour’ project will be a visit to Dedham. I have been poring over the footpath map to find an angle on the river which I have not yet painted. And I think I’ve found a good one!. Festival news: I’ve done three more visits to exhibiting artists since I last posted. Catherine Allen, a jeweller living at Leavenheath www.paintboxcrafts.co.uk, Caroline Sullivan, from Martlesham Heath, with her designer knitwear and Viking jewellery who has an etsy shop www.etsy.com/shop/bycarolinesullivan and Moira Goodall, a potter from St Lawrence Bay www.moiragoodall.com . I only have two more to do now!